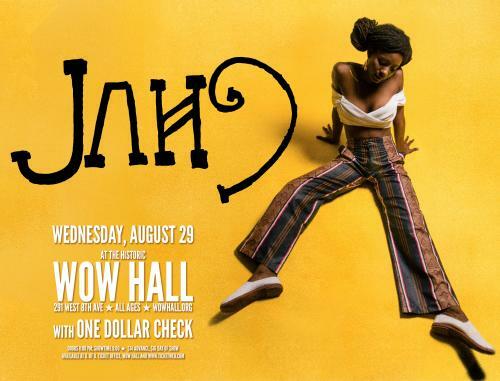 On Wednesday, August 29, the Community Center for the Performing Arts proudly welcomes Jah9 back to the WOW Hall along with Eugene’s own One Dollar Check. “Inspired by the fearless truth-telling of Nina Simone, and projecting the ethereal aura of early Erykah Badu,” according to billboard.com; Jah9 has become a femiNINE icon of a movement based on universal consciousness. Deeply mystical, Jah9 has emerged from a chrysalis of poetry and dub of Jamaican roots reggae. Her philosophy– profoundly spiritual, and her style – “Jazz on Dub”. Born Janine Cunningham, Jah9 spent her first nine years in Falmouth, Trelawny, on the rural western edge of Jamaica, before moving into the city of Kingston, where she ventured inward and found an outlet for her feelings in the words that she wrote. Jah9 became a staple on Jamaica’s underground poetry scene by 2009. The empty spaces of instrumental dub allowed a young Jah9 to find her voice, and her demos caught the attention of the legendary singer Beres Hammond as well as popular producer Don Corleon; meanwhile the passion in her live performance and her love for live music caught the attention of her peers and assisted in jump starting what is known to the world as the ‘reggae revival’. Jah9 has gone on to successfully release two albums; New Name (2013) and 9 (2016). New Name, produced by pioneer selector Rory ‘Stone Love’, was voted album of the year by AchisReggae.com and brought forth the playful hit “Avocado”. In that same year Jah9 released the single “Steamers A Bubble” which has become an anthem for herb users worldwide. The 9 album represents Jah9’s shifts in energies to unveil a deeper more personal development of her ‘Jazz on Dub’ sound. The album was voted #2 Reggae Album of the Year by billboard.com. Described as "black magic," Jah9 and her dub inspired band, The Dub Treatment, is a staple on European and American reggae and world music festivals -- having performed at Boomtown (UK), Roskilde Fest (DE), Paleo Fest (CH), Rototom (ES), Caliroots (US) among many others. A certified yoga instructor trained in Kemetic, Ashtanga and Iyengar methods, Jah9 has been known to compel her audiences during her live set to pause, breathe deeply and feel empowered. Intimately engaging with her fan base, Jah9 also curates an organic music-based yoga experience she calls ‘Yoga on Dub’. Jah9 is rooted in her African heritage and driven to serve. In 2015, while on tour in Italy and Malta, she was intent on engaging with African refugees, sharing with them insight on the new environment they would face, natural wellness as well as yoga/breathing as healing therapy. `Jah9 is currently working in studio with legendary producer Clive Hunt on her follow-up to 2016’s 9 album. Jah9’s new single “Field Trip” is now available everywhere. This is the third release off her upcoming Feelings EP (vinyl exclusive) out this August via VP Records, also featuring singles “Feel Good” and the more recent “Love Has Found I”. One Dollar Check formed in 2012 by singer/songwriter Gared Sanne, rhythm guitarist/songwriter Rocky Garton, lead guitarist Aaron Pierce and drummer Charles Gallegos. In 2012 the band recorded their debut, a 5-track EP recorded at Telos Studios in Eugene. By 2013, the band had undergone several member changes, and acquired current bassist Elijah Constantinescu just before recording the band’s 1st full-length album Feels So Right. Released in 2014, it is influenced by the likes of Pepper, Tribal Seeds, Rebelution and more. After the release of Feels So Right, One Dollar Check extensively toured the Pacific Northwest including California. In December 2016, founding member Rocky Garton left the band and a new sound and performance began to take shape. Self-described as Dirty Roots, the bands high energy paired with elements of hard rock and blues have set them apart within the West Coast reggae scene. Their multi-genre style is paired with powerful lyrics that appeal to all ages. One Dollar Check officially signed to Roots Musician Records out of California in December 2017. Their second studio album Fill the Void was released January 2018 after being recorded at House Dark Studios in Eugene, with the final mastering being done by E.N. Young at Imperial Records. Shortly after the band embarked on their most recent West Coast tour playing 30+ dates over a 2 month time period. One Dollar Check has had the honor of sharing the stage with the likes of Katchafire, Fortunate Youth, Natural Vibrations, Anuhea, Maoli, Josh Heinrichs, Through the Roots, Iya Terra, One Drop, Rebel Souljahs and more. The band has had the privilege of playing notable events such as Northwest Roots Festival, North Umpqua Hempfest, Oregon Country Faire, as well as the Oregon Growers Cup. Keep up with all things One Dollar Check by joining their mailing list at: OneDollarCheckMusic.Org.